We are now on our 4th location, moving into the 2433 Mariner Square Loop location in August 2015. We are in a small office complex with grass, trees (big redwoods) and even picnic tables. When the weather is nice it's a great outdoor area for lunch or a stitching break. We do plan for this to be last time we move (it's too much work!). March 27, 2017 marks our 19 year anniversary at Needle In A Haystack, having opened our doors on March 27, 1998. The shop was started from scratch vs. buying out an existing business (we get asked this often). We were located on Park Street for the first 6 years, moving to Webster street from 2004-2010, Clement Avenue in 2010-2015 and now MSL. All of the staff are stitchers themselves and while we don't claim to be experts in every technique out there, we are generally knowledgable about many stitching techniques and can usually give pointers to others who are specialists in a particular area. While reading was my first love as a child I've been doing needlework or crafts of some kind since about age 10. My grandmother taught me how to embroider and do some sewing but much of it I picked up on my own. Needlework skipped a generation in my family and both my sister and I do various aspects of it (she does absolutely beautiful crochet). I lived in Santa Fe, NM until I was 11, when we moved to California (mid '60s). I went to junior high and high school here and later moved to Seattle to attend college. I have a degree in Computer Science from Seattle Pacific University (1980), where I started out as Textile major in 1975. I came back to California in 1984 to work for a computer firm in Berkeley, at which point I moved to Alameda (and then married a native Californian). In my early 20's, I traveled for a couple of years with two different gospel groups and saw a great deal of the country. It was during my travels withoneof these groups that I taught myself to needlepoint and spent many hours on the road making up projects. It was also during this time that I found my first counted-cross stitch patterns on the road. It wasn't until years later when I took an actual class in needlepoint that I discovered I'd being doing half-cross stitches vs. tent stitch on my needlepoint. I'd always wondered why my needlepoint pieces seemed so distorted when I was done and then I knew :-). I worked in the computer field from 1979 to 2001, first as a software engineer and after 1994 as a manager of them. In 1997 I started seriously thinking about opening a shop and credit two people with really making me believe it was possible. First and foremost is my husband Carl, who believes that I can do anything I put my mind to. The second is C.A. Wells who helped me understand that I could build it as a business without giving up my day job. When you've worked in the computer field as long as I have it gets in your blood and it's hard to walk away from for many reasons. Once I'd made the decision it was possible it took many months to plan and when I started to look for someone to manage the shop I was most fortunate in finding Ada Haydon. Ada managed the shop from Jan. 1998, even before it opened, until October 2001, when she left to join her husband after his transfer back east. Ada now owns Eye Candy Designs, her needlepoint design company. Ada was the first of many wonderful staff to come to the shop and it's really my staff who have made my vision of the shop come to life. Over the years I've also had the pleasure of making wonderful friends in our industry. 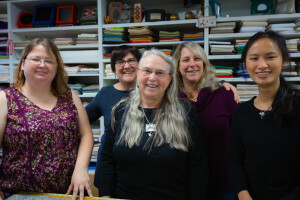 Four of them, Jean Lea of Attic Needlework, Deb Clark of Stitchville USA and Roz Vancil and Jeannine Cheney of Acorns and Threads are my "partners in crime" - we're collective known as the Needlework Maffia. I have two other great shop owner friends in Janice from Traditional Stitches and Linda Mendenhall of Old World Designs. The friendship of these ladies is a godsend to me on a daily basis. The shop has been a way for me to combine two very different aspects of my life and I'm the one that handles all the website and computer work for the shop (I'm really a geek at heart). After being layed off in 2001 I had been spending most of my time at the shop while looking for another computer job. In August 2003 I decided not to go back to the computer world and instead concentrate on the shop, taking over many of the day-to-day jobs others had been doing for me. In 2004 I had a small part in a Mythbusters episode about find needles in a haystack, which was great fun. I served on the board of directors of TNNA as chair of the Counted-Thread & Embroidery group from 2004-2010. I work a number of needlework techniques such as cross-stitch, needlepoint, embroidery, hardanger, pulled-thread, drawn-thread, silk ribbon embroidery, goldwork, Bunka (Japanese embroidery) Brazilian embroidery, Punchneedle embroidery and a bit of crewel and Stumpwork. I also do machine embroidery on my Pfaff as well as gardening, baking, card-making and beading. I've rarely met a hand-working hobby I didn't like :-). I'm at the shop Tuesday-Saturday except Thursday (and sometimes even then), when I try to work from home to do the web site updates. Even with 10 hour days, sometimes 6 or 7 days a week I still love being a shop owner! Debi is normally in the shop Tuesday and Thursday, spending the rest of her work week at our other Happy Place - The Container Store. Debi has been with the shop for eons and knows about an amazing range of needlework. Jennifer has been with the since 2008 and is our primary mail order person (assisted by Marissa). When packages are mailed to you Jennifer most likely has handled from the pretty wrapping until it's sent to you. Jennifer enjoys cross-stitch and needlepoint. Cymone joined the staff in 2016 and has a background in quilting but we've gotten her hooked on cross-stitch and needlepoint. Cymone handles a lot of our phone orders, in store customers and occassionally is the one to wrap up your packages to be shipped. Marissa has been a customer for many years along with her mom and sister and joined the staff in 2016. She enjoys cross-stitch and needlepoint. In addition to handling your phone questions and those who come to shop in person, Marissa is our mail order assistant. Why does your toll-free number have an extra character? Many people have asked why the mnemonic for our toll-free number of 877-HAYSTACK has an extra character in it. The "K" is superfluous and without it the number would be 877-HAYSTAC (877-429-7822) which isn't nearly as easy to remember. This should never cause a problem with any phone system, which will ignore the extra digit. So feel free to use it if it helps you remember the number. But be careful, we've been told that leaving out the 'C' will get you a "steamy" phone call. We were pleased to be the December 1998 shop focus on the Caron Collection web site (in our first year of business). In January 1999 we were given a Best of the Net award by the Needlepoint guide at The Mining Company. Also in 1999, we became a member of the Needlecraft Showcase, which includes many on-line needlework shops, distributors and suppliers.